Western blot analysis of extracts from HeLa cells, untreated or nocodazole-treated (1 μg/ml, 18 hr) using Phospho-APP (Thr668) (D90B8) Rabbit mAb (upper) or APP Antibody #2452 (lower). 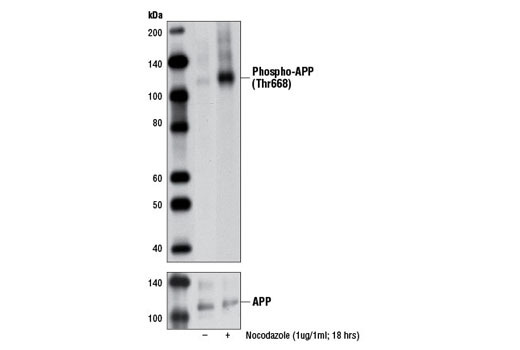 Phospho-APP (Thr668) (D90B8) Rabbit mAb detects different isoforms of endogenous amyloid β (A4) precursor protein only when phosphorylated at Thr668 (or the corresponding position of other isoforms). Monoclonal antibody is produced by immunizing animals with a synthetic peptide corresponding to residues surrounding Thr668 of human APP protein.